With the release of the 20 players on Saturday, the Patriots have made their initial 53-man roster. It is interesting to note that the breakdown consists of essentially 4 WRs (five if you count Matthew Slater), 4 TEs and 4 RBs with a FB (James Develin). The good news is that Danny Amendola will indeed begin the season on the roster and not on PUP and the fact that they kept just four wideouts to begin means that rookie Malcolm Mitchell must be very close to returning to action. So what can we expect to see from the Patriots offense based on the personnel they’ve kept. One thing is for sure, with four TEs on the roster, you can expect a lot of the two-TE run heavy sets in either “12” personnel (1 RB, 2TEs, 2WRs), or in the “22” personnel with (2RBs, 2TEs, 1 WR). With Rob Gronkowski and Martellus Bennett, the Patriots have bookend “Y” tight ends that can be excellent run blockers with James Develin leading the way. 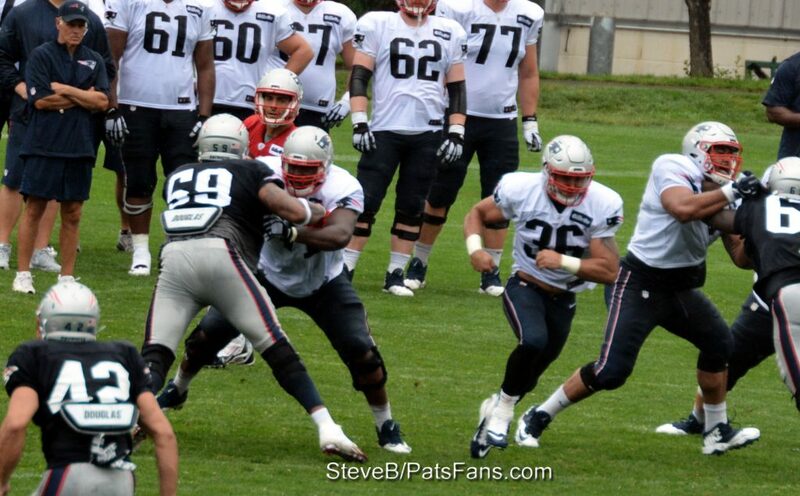 We can expect a lot of run-heavy formations like this with either LaGarrette Blount or James White in the backfield. With the extra blockers in-line, it will open up some holes in the running game and put the offense into favorable down and distance scenarios. Of course, it also opens up the play-action passing scenario as well. Opponents will have to respect the run and with Gronkowski and Bennett, they’ll be able to face a base defense with each at times getting isolated on a linebacker. With Julian Edelman and Chris Hogan getting the majority of reps initially, we can expect them to each rotate in and out of the slot. Hogan is a bit bigger and faster in the straight line but not as quick in the short areas and out of cuts. They’ll move them around to find favorable matchups but look for Hogan to take over the old Brandon LaFell role as the “X” until Mitchell is healed up. White and D.J. Foster are the third down and passing backs and each brings a little bit of a different element to the table. White has the experience and knows the offense inside and out. Foster is still learning it, as he missed a ton of time this summer. He still needs to work on his protection and ball security skills but he’s electric in the open field. It will be interesting to see if the Patriots move him in motion and slide him into the slot on occasion, something he did in college at Arizona State. He and White give them a couple of nice extra pieces in the passing game. Jimmy Garoppolo will have some intriguing weapons to work with now. The key is to get the rust off of Amendola as quickly as possible and hopefully get Mitchell back on the field as soon as possible. They have some very impressive pieces to exploit mismatches on the field with. The problem is, in the short term, that most of them haven’t worked together as a unit all summer. There’s lot of work to get done before they head out to Arizona to face the Cardinals. But the coaches and veterans can get it moving in the right direction as soon as they get back to practice. It is time for Jimmy G. and the veterans on the offense to step up and put the work in. This entry was posted in Patriots Commentary, Patriots News and tagged 2016 Patriots Draft, 2016 Patriots Roster, 53 Man Roster Projection, A.J. Derby, Bill Belichick, Brandon LaFell, Chris Hogan, Clay Harbor, D.J. 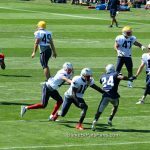 Foster, Danny Amendola, Dion Lewis, Jimmy Garoppolo, Julian Edelman, LaGarrette Blount, Malcolm Mitchell, New England Patriots, NFL, Patriots, Patriots offense, Patriots wide receivers, Rob Gronkowski, Tom Brady on September 3, 2016 by Steve Balestrieri. Had to use my favorite Willie Nelson quote in there, as we do every year during the third preseason game. The Patriots and the Panthers get at it tonight for the third preseason game and we have five areas of the game to watch for. With the starters playing into the third quarter, it still isn’t a “dress rehearsal” as Bill Belichick so aptly pointed out this week to members of the media who asked him as such. But we will get a chance to see the starters or whoever is starting this week for an extended look so that will be fun. Who Steps Up at WR: With the preseason winding down, we still won’t see Julian Edelman, Malcom Mitchell or Danny Amendola (PUP), so Chris Hogan will be the go-to guy early. But here is where it gets interesting. Keshawn Martin is back to practicing and should play against the Panthers. 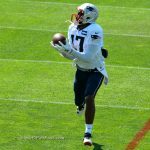 He, Aaron Dobson, Chris Harper, DeAndre Carter and Devin Lucien are all locked in a battle for the final wide receiver spot on the roster. Martin is going to have to show that he’s healthy and able to produce. His versatility and production give him a leg up on the others but they’ve been working with Jimmy Garoppolo and Tom Brady in his absence so they’ll likely have a bit more chemistry and timing down with the QBs. Carolina has one of the better defenses in the league and they’ll be playing into the second half, so this should be a good test for all of the WRs, as they have just two games left to make an impression with the coaching staff. How Much Will Butler/Ryan Play at CB? 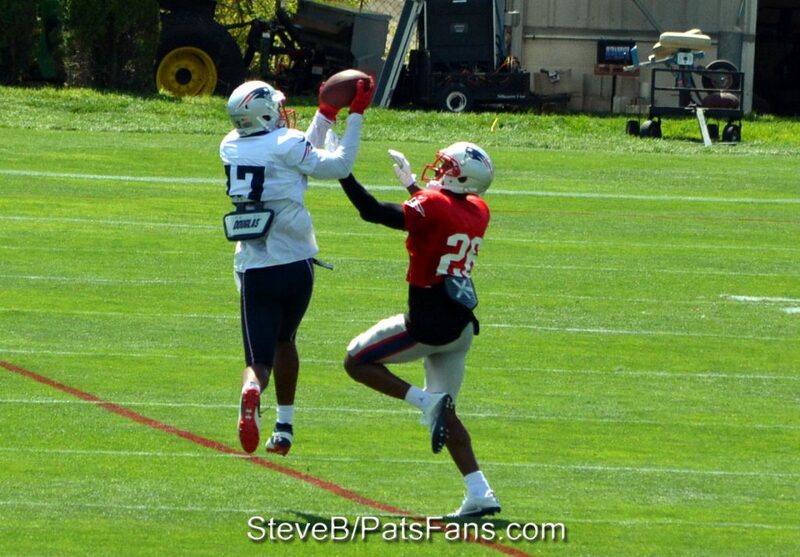 With the roster competition going on at the corner position, Malcolm Butler and Logan Ryan are locks for the roster. Ryan just recently shed his red non-contact jersey and they may play only the first quarter as the coaches may want extended looks from the young corners vying for roster spots and playing time. 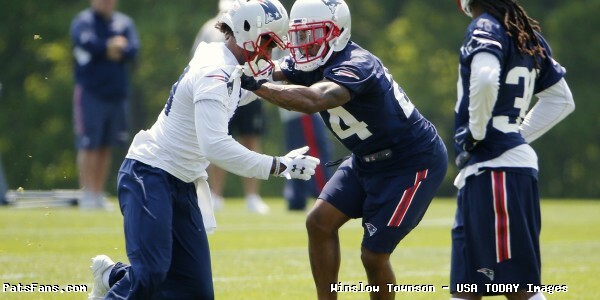 Rookie top draft choice Cyrus Jones is another lock and he’s played well this summer. He and second-year corners Justin Coleman and Darryl Roberts are vying for reps with rookie UDFAs Jonathan Jones and Cre’Von LeBlanc. Coleman is a near roster lock and the remaining three are essentially battling it out for a final roster spot. Jonathan Jones had the early advantage in camp but LeBlanc has been right on his heels. Both have played very well this summer. Jones is gifted athletically while LeBlanc is a guy who saw his draft stock slip because he didn’t test well this spring. They may each see some time against Carolina’s top offense. Roberts didn’t have a great summer but turned it up against the Bears a week ago. He had a good week of joint practices and then had three passes defensed in the preseason game. He’s still in the mix. 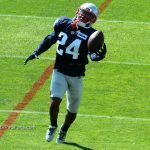 Gaffney, Foster Each Trying to Earn a Roster Spot at RB: Much of the social media banter with the Patriots RBs centers around if the team will make a move for another back to come in and add to the depth or lack thereof at the position. LeGarrette Blount is, for now, the big back who will carry the ball between the tackles. James White is the third down passing back specialist. He’ll catch the ball out of the backfield or split out wide to create mismatches. Brandon Bolden is the STs player who can sub in as needed. That leaves a single roster spot there for the taking since Dion Lewis will start the season on PUP when it was learned on Sunday that he’d need additional surgery on his knee. Tyler Gaffney and D.J. Foster are each vying for the final spot. Gaffney was originally drafted by Carolina two years ago before being hurt and spending the past two seasons on IR. He’s healthy now and offers the additional big back depth of running the ball between the tackles and catching the occasional pass. He shined against New Orleans in the first preseason game. Now he’ll be looking to do it against his former teammates. Foster was one of the most intriguing pickups of the spring. An UDFA from Arizona State, he is the quickest and smoothest route runner of the Patriots backs. With nearly 2500 yards each running and receiving in college he is a guy that has a ton of potential. But he pulled a hamstring in minicamp and has been MIA all summer. Now finally healthy, he’s going to have to show, and quickly that he belongs. 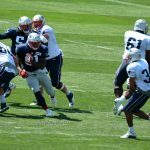 Offensive Line Play Against Tough Defense: While the game planning aspect is out of the game here, this will be a good test for the Patriots offensive line against a very tough Carolina front seven. And the Patriots seem to have their starting five OL set with the trade of Bryan Stork and the news that Sebastian Vollmer is probably going on IR. Nate Solder, Joe Thuney, David Andrews, Josh Kline and Marcus Cannon will be the Pats starting unit this week and on Week 1 in Arizona. Now is the time for coach Dante Scarnecchia to get this unit’s play down and get the communication and calls in seamlessly. One of the issues last year was the constant mixing and matching done because of the numerous injuries that hurt their continuity. Here’s a chance to begin to work on that and getting the group to function as one. Finally, the Quarterbacks, Who plays and how much? Tom Brady made it clear that he wanted to play, wants to play in the preseason and expects to play. Brady made the trip to Charlotte and is expected to play, at least some but who starts? If I’m Bill Belichick, I give Brady a series, hopefully around 6-10 snaps to get him a feel for game action again and then have Garoppolo play into the third quarter. Although he won’t have many of his weapons (Edelman, Gronk, Amendola) for this contest, its valuable experience against a tough defense that will serve him well when the games count for real in two weeks. This way we’ll see all three QBs get some game action in as Brissett can log some snaps in the 3rd-4th quarter and gain some needed experience himself. There’s no right or wrong answer here, Belichick and Offensive Coordinator Josh McDaniels will have to feel their way here and do what they feel is right. 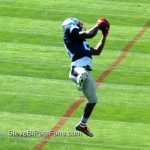 This entry was posted in Patriots Commentary, Patriots News and tagged 2016 Patriots Draft, 2016 Patriots Roster, 53 Man Roster Projection, Aaron Dobson, Bill Belichick, Carolina Panthers, Chris Harper, D.J. 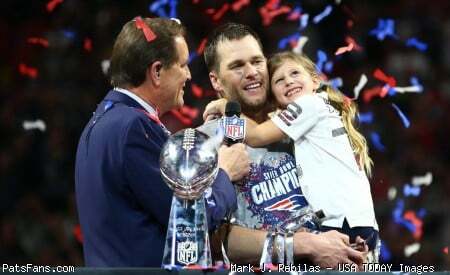 Foster, Danny Amendola, DeAndre Carter, Dion Lewis, Dont'a Hightower, Geneo Grissom, Jabaal Sheard, Jacoby Brissett, Jimmy Garoppolo, Julian Edelman, Keshawn Martin, LaGarrette Blount, Malcolm Butler, New England Patriots, NFL, Patriots, Rob Gronkowski, Rob Ninkovich, Tom Brady, Tyler Gaffney on August 26, 2016 by Steve Balestrieri. The Patriots zigged while the rest of the world zagged. The talk of the social media world surrounding New England was that the Patriots would probably try to swing a deal for a running back. 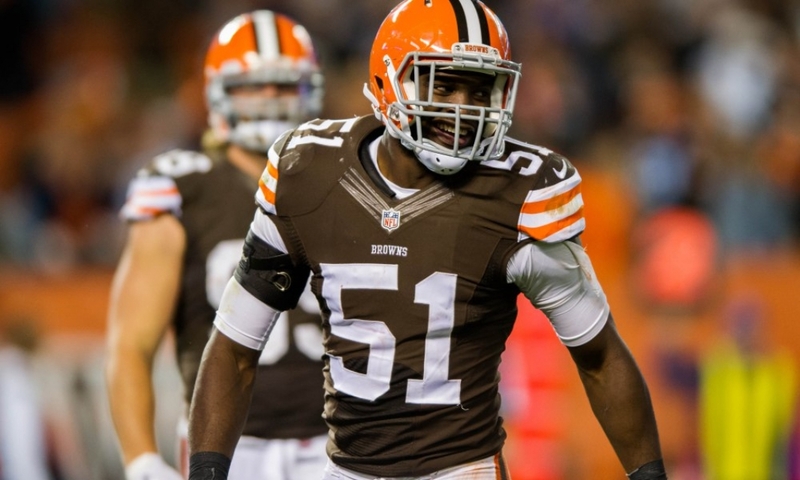 Bill Belichick and the Pats, however, swung a deal for the Cleveland Browns former #6 overall pick Barkevious Mingo. He’ll instantly upgrade the depth of the roster on the edge. 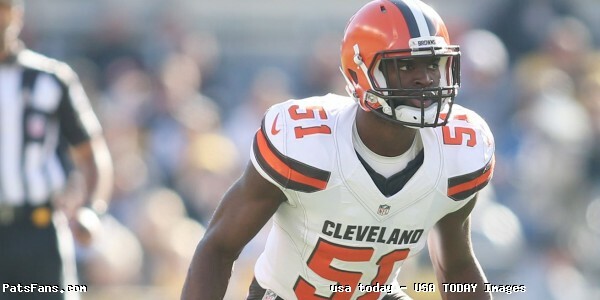 Besides having the coolest name in the NFL, Mingo much like Jabaal Sheard came into the NFL with the Browns after having been scouted by New England. And, like Sheard, after a good rookie season, he’s watched his production fall off the past two years. Mingo, 6’4, 240-pounds came out of LSU in the 2013 NFL Draft and was thought to be one of the next big-name edge rushers. He notched five sacks in his rookie campaign, saw that fall to two in 2014 and got zero a year ago as he was relegated to mainly backup duty. The Patriots signing Sheard a year ago was an under the radar signing that paid off big time for them. They’re obviously hoping that the signing of Mingo will be catching lightning in a bottle twice. Sheard suffered an MCL sprain and is expected to miss 2-4 weeks after having an outstanding summer. 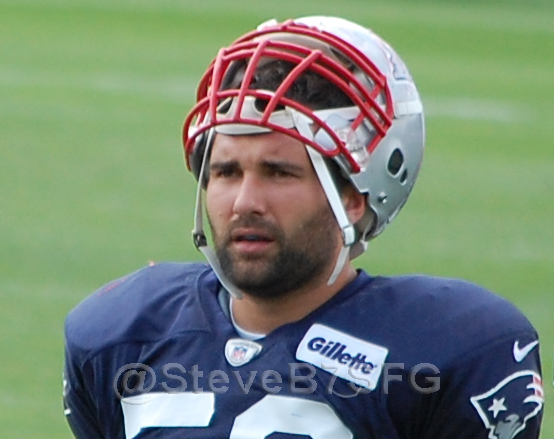 Rob Ninkovich tore a triceps muscle and is expected to miss possibly the first month of the season. Shea McClellin has been on the shelf as well with an injury. The team still has Chris Long, Trey Flowers, Geneo Grissom and Rufus Johnson in the meantime. Mingo gives them the versatility to either line up on the edge as a defensive end or blitz as an outside linebacker. This is a really nice pickup by Belichick, who was still working out the compensation for the trade, but the addition of Mingo immediately adds more depth and versatility to the Patriots front seven. 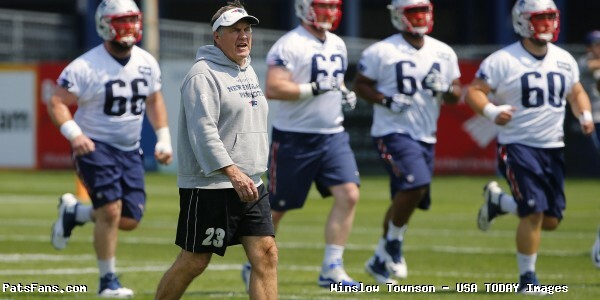 This entry was posted in Patriots Commentary, Patriots News and tagged 2016 Patriots Draft, 2016 Patriots Roster, 53 Man Roster Projection, Barkevious Mingo, Bill Belichick, Cleveland Browns, Geneo Grissom, Jabaal Sheard, Patriots, Patriots edge rushers, Patriots Training Camp Photos, Rob Ninkovich, Rufus Johnson, Trey Flowers on August 25, 2016 by Steve Balestrieri. 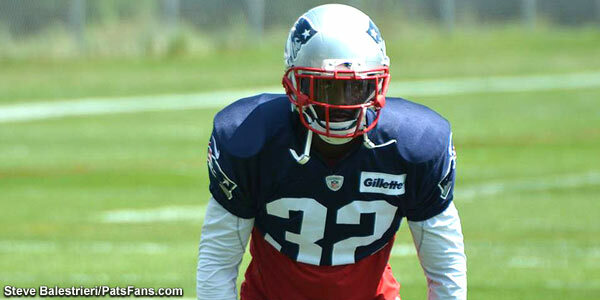 The Patriots have released three more veterans today as they cut ties to CB E.J. Biggers, RB Donald Brown and DE Frank Kearse according to sources. Bill Belichick has always favored cutting loose veterans as early as possible if they don’t fit into the team’s plans, to give them a better chance of latching on with other teams. This seems to be the case here as none of the three appeared close to landing a roster spot. Brown seemed to have a good shot at making a roster spot. LeGarrette Blount and Dion Lewis were coming off of serious injuries, Tyler Gaffney is unproven and Brandon Bolden is mainly a ST’s player. That left James White and a bunch of question marks. But Brown, got hurt early and camp and struggled to get back on the field. Both Gaffney and Blount had solid preseason outings in back-to-back weeks so the team will probably roll with them, White and Bolden to at least initially start the season. Kearse was a DE in Washington and projected to be an interior player here. He didn’t stand out much during training camp and with others playing at a higher standard, he wasn’t projected to make the team. Biggers came from Philadelphia as a free agent and signed a 1-year, $840,000 contract with a modest $25,000 signing bonus. With a lack of depth from 2015 in the Patriots secondary, he was thought to be at least in the mix for a veteran presence at cornerback. But undrafted rookies Jonathan Jones, Cre’Von LeBlanc as well as 2nd-year player Darryl Roberts have all outplayed him this summer. Not that Biggers play was poor, but the younger, faster and more athletic players were standing out daily. That forced the team to release V’Angelo Bentley and now Biggers. 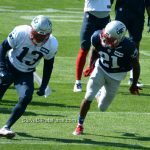 With his release, the corner position now has Malcolm Butler, Logan Ryan, Justin Coleman, Cyrus Jones, LeBlanc and Roberts as their six top players. They may only opt to keep five so the competition will heat up in the final two weeks. 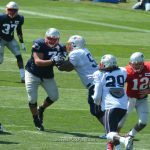 This entry was posted in Patriots Commentary, Patriots News and tagged 2016 Patriots Draft, 2016 Patriots Roster, 2016 Patriots Training Camp, 53 Man Roster Projection, Bill Belichick, Donald Brown, E.J. 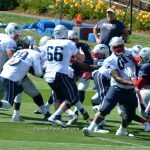 Biggers, Frank Kearse, New England Patriots, NFL, Patriots on August 23, 2016 by Steve Balestrieri. 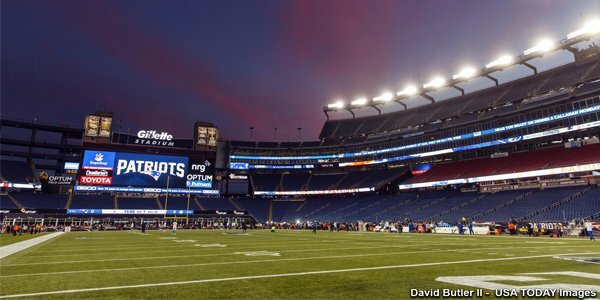 The Patriots and Saints open the preseason for both teams with a game tonight. The big focus is what to watch for in the game. It is unlikely we’ll see Drew Brees or Tom Brady much more than a series or two. Brady has appeared in the preseason opener the past few years but may sit this one out and Brees told the media on Wednesday that he will only play a series. 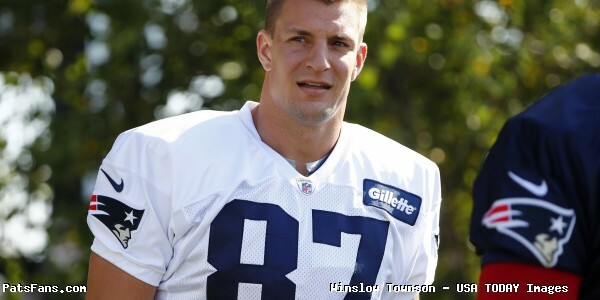 Players like Rob Gronkowski, Julian Edelman, and Martellus Bennett will likely not play. 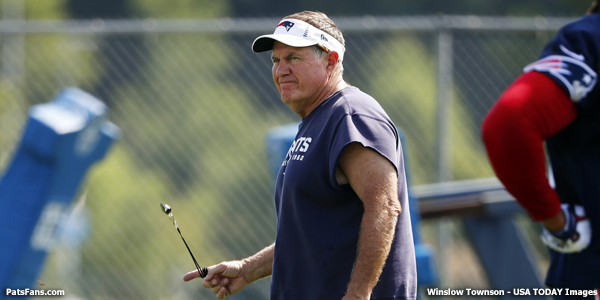 So what things will Bill Belichick and the coaching look to accomplish tonight? Being the first game of the preseason, the score is pretty much secondary to getting some things sorted out. And with a solid 90-man roster heading into preseason action, it is imperative for the coaches to get each of the guys on the bubble as many looks as possible. 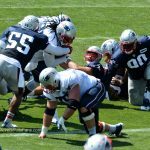 Offensive Line Groupings/Play: The Patriots offensive line was the weak link in the team in 2015 and they suffered a slew of injuries that ruined any chance for continuity a year ago. The team brought back Dante Scarnecchia in the hope that he can get the line play back to where it was before he retired. Injuries have once again reared their head early in camp. 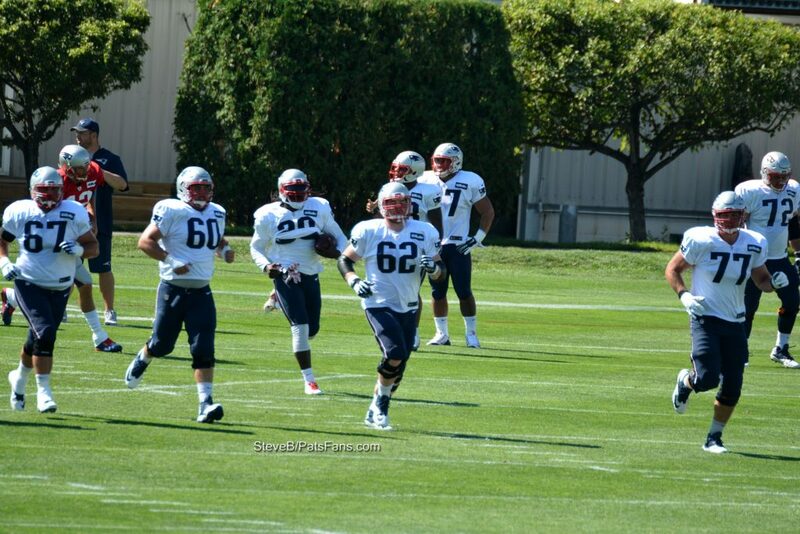 Sebastian Vollmer is still on PUP and is out. Jonathan Cooper was hurt early in camp and hasn’t practiced in 10 days. Tre’ Jackson will be out as well and how much Bryan Stork plays after suffering yet another concussion will be a question mark. Rookie offensive lineman Joe Thuney has been solid in camp thus far at left guard. He and fellow rookie RG/C Ted Karras have performed well. But what will bear watching is how well the line holds up in protection for the three quarterbacks and just as importantly, can they open any holes in the running game. We should see plenty of different combinations as the game goes on. There is still plenty of room for competition here. 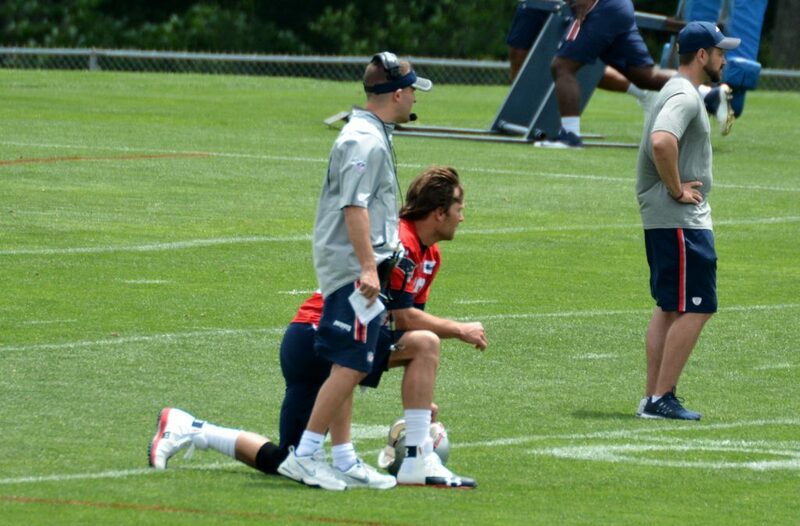 This will be the first test to see how well Scarnecchia’s tutelage is progressing. Quarterback Reps: The elephant in the room, everyone wants to know, who starts, how much does each play and how will the offense look under each? This overblown story line continues to be the talk of training camp and as much as Bill Belichick gets tired of answering it, it isn’t going away. Tom Brady has taken the first reps with the offense for the majority of camp but it looks like he’ll sit for the first preseason game. 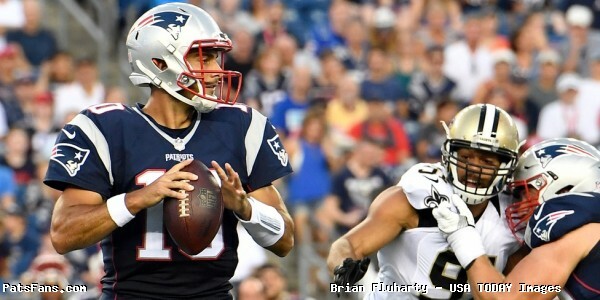 Garoppolo will take over and play the first half and possibly a series to start the second half. Jimmy G. didn’t have a great week after a nice start to camp and he’ll be looking to rebound. He’ll have to process things a bit quicker and make some better decisions with the football than he did the past 3-4 days. Jacoby Brissett would then have the second half to get some much-needed experience and get into a rhythm with the offense. This will be a balancing act with Belichick and Josh McDaniels as they’ll go with how things play out on the field. There is no right or wrong answer and I’m sure Belichick will say tomorrow night, that they did what they felt was best for the team. Running Back Depth: One of the areas that we pointed out as a big area of need in the offseason was the running back position. Both LeGarrette Blount and Dion Lewis are coming off of season-ending injuries. Blount has looked quick and he’s running much better than I would have thought possible this early in camp. He should see a few reps early in the game but other than that, it is all on the backups. Check out Lee Schechter’s nice piece on the running backs from yesterday. With Dion Lewis still on PUP, the backup positions are still wide open. James White has the most experience and he’s a good pass receiver but he goes down very easily when running the ball. He’s still too one-dimensional so who gets some reps tonight? Tyler Gaffney is finally healthy after two lost seasons with the Panthers and the Pats where he never saw the field. He’s a big back at 6’0, 220 pounds and has shown some quickness at hitting the hole and good vision as he’s gotten more work with Donald Brown sidelined. He should get plenty of chances to show what he can do against the Saints. One possibly alarming thing I’ve noticed with him is that he tends to run upright perhaps too much so when going thru the hole, it is something that sets him up to take big hits. Joey Iosefa and Brandon Bolden should see some work as well. Brown and D.J. Foster probably won’t play as they’ve been out nursing injuries. Foster was one of the more intriguing guys that came out of the UDFA class but he just hasn’t been on the field enough to see anything from. Wide Receiver Competition: With Julian Edelman and Danny Amendola out, I don’t expect to see much of Chris Hogan tonight. That opens the door for the other WRs to stake out a claim for additional reps and a chance to stick on the roster. 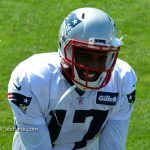 Veteran Nate Washington is back on the field, and he, along with Keshawn Martin, Chris Harper, Aaron Dobson, DeAndre Carter, Devin Lucien and 4th round draft pick Malcolm Mitchell have been embroiled in some terrific competition this summer. Mitchell has been coming on as of late and it will be interesting to see if the team tries to get him some work with Garoppolo early in the game. Don’t go to sleep on Dobson yet, he started out this summer very strongly although lately, his targets have tailed off. But the biggest thing for him is that, up to now, he’s been able to stay healthy. Cornerback Rotation: The Patriots spent their top draft pick on CB Cyrus Jones this spring. 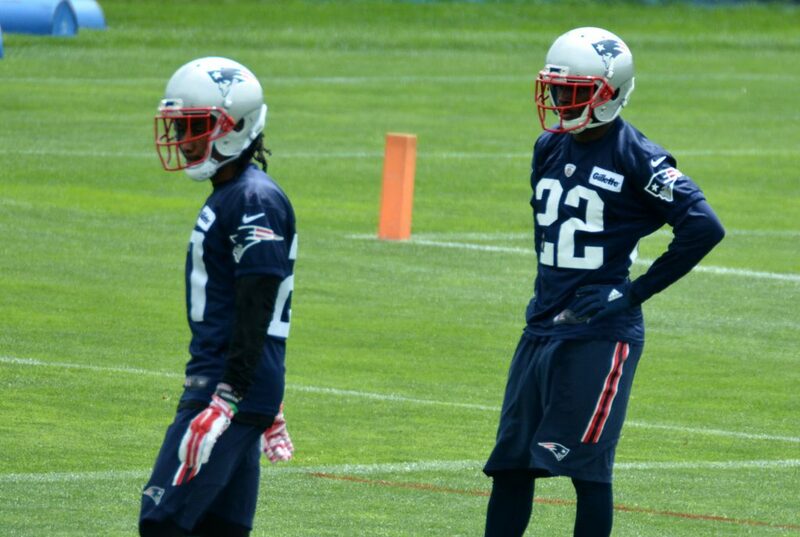 But as of now, he’s the 4th CB in the rotation behind Malcolm Butler, Logan Ryan, and Justin Coleman. That isn’t a knock on Jones, it is just that Coleman, with a year in the system, has fared better thus far in training camp. With Ryan still sporting a red non-contact jersey, he probably will sit the opener out. Will the Patriots thrust Jones into the starting right corner spot with Coleman remaining in the slot? Or will they go with the veteran E.J. Biggers or perhaps Darryl Roberts who started the first preseason game a year ago? Like the WRs, the competition has been fun to watch this summer at corner. 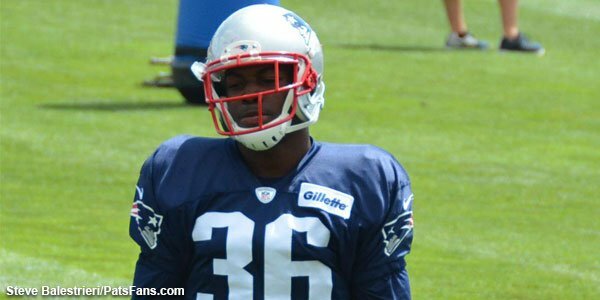 Biggers, Roberts, and UDFAs Jonathan Jones, Cre’Von LeBlanc, and V’Angelo Bentley are all fighting it out for essentially one spot on the roster. Jonathan Jones has flashed with his speed and athleticism thus far but the games should really bring out the best in the struggle. Trey Flowers: The second-year DE has a propensity for rushing the QB. He had a strong camp a year ago and has been ramping up his play the past few days. He’s locked in a struggle with Geneo Grissom and Rufus Johnson for playing time. All three made the roster a year ago. Markus Kuhn: The big German defensive lineman arrived with little fanfare from the Giants and was thought to be a long-shot to make the roster. But he’s gotten plenty of reps and has shown himself to be really stout at the point of attack in practice. Now he’ll get the chance to show it in a game. A.J. Derby/Clay Harbor: The two tight ends are vying for the coveted third tight end spot behind Rob Gronkowski and Martellus Bennett. Derby is a converted QB who spent last year on IR. But he’s shown a knack for making some plays in the passing game. He has good athleticism and has displayed good hands at catching the ball. Harbor was signed as a free agent from the Jaguars but started the season on PUP. Now he’s back to work and has the experience and production to be a “move” tight end in the offense. He and Derby may see work together on the field in the “12” personnel sets with two tight ends. 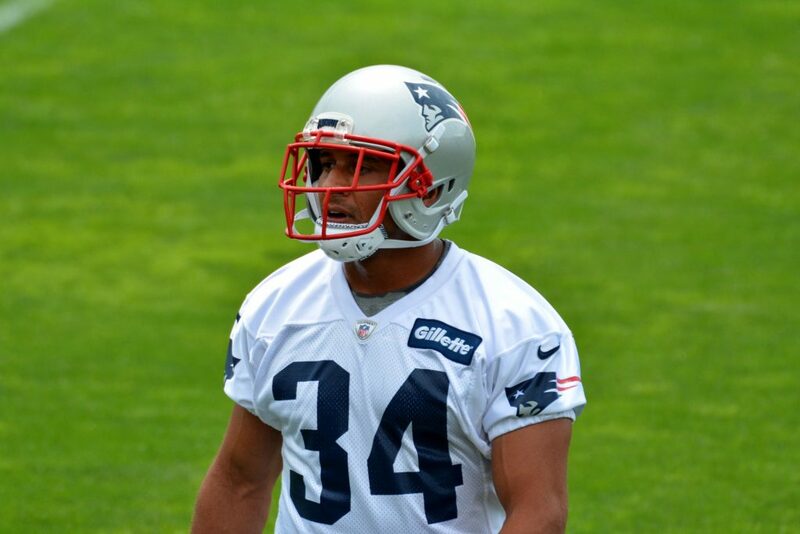 Kamu Grugier-Hill: The rookie LB/S has crazy athleticism and could be a factor on special teams. But with the lack of depth at linebacker, he could see some significant snaps on defense as well. The team used him at times covering the TE Bennett during scrimmages. It will bear watching if he can carve out a role for himself. 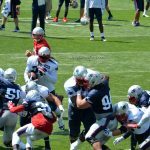 This entry was posted in Patriots Commentary, Patriots News and tagged 2016 Patriots Draft, 2016 Patriots PreSeason, 2016 Patriots Roster, 53 Man Roster Projection, Bill Belichick, Danny Amendola, Dion Lewis, Dont'a Hightower, Jabaal Sheard, Jimmy Garoppolo, Julian Edelman, LaGarrette Blount, New England Patriots, New Orleans Saints, NFL, Patriots, Patriots edge rushers, Patriots Training Camp Photos, Rob Gronkowski, Rob Ninkovich, Tom Brady, Trey Flowers on August 11, 2016 by Steve Balestrieri. 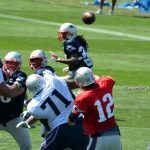 The Patriots concluded their sixth training camp practice on Wednesday morning in full pads, their third such workout under sunny, warm skies at the Gillette Stadium practice fields. The hitting was heavier than in any session yet with the focus of the day being situational football. 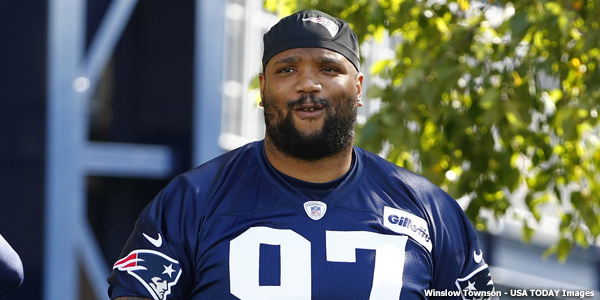 Alan Branch passed his conditioning run and was back at practice today. But the team was easing him in. Early Focus on the Running Game: The morning started out with the fans, the smallest crowd to date, singing a Happy Birthday ditty to QB Tom Brady who acknowledged the gesture with a wave to the carolers. 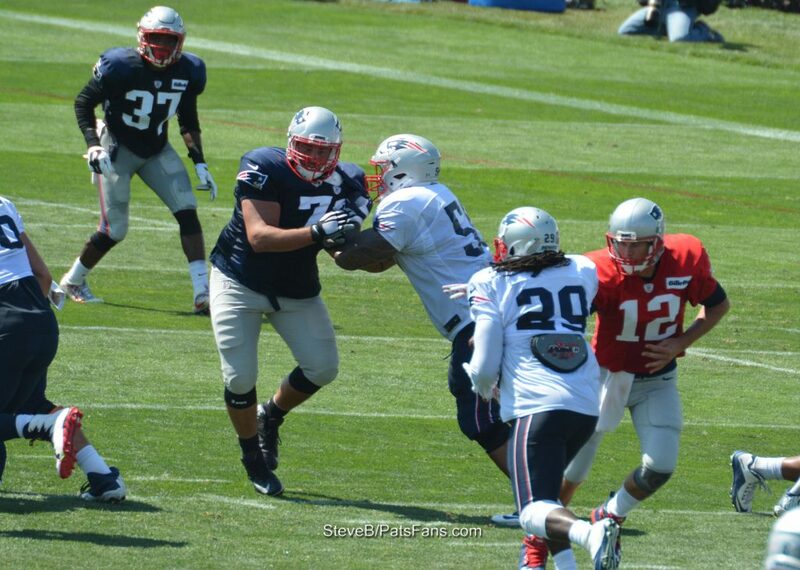 The early focus was on the running game, LeGarrette Blount seems very healthy this summer and he, Tyler Gaffney, D.J. 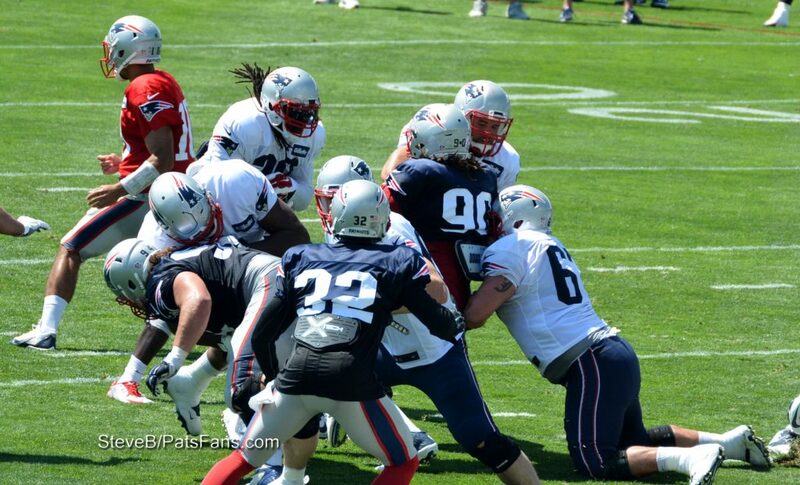 Foster, Brandon Bolden and James White all saw some work carrying the ball. Gaffney did some of his best running of the summer today, displaying good vision and hitting the holes quickly. There was some solid hitting going on with some audible pops heard up in the stands for the first time. With Bryan Stork out, David Andrews, Joe Thuney, and Kyler Kerbyson all got work at center. Thuney seems to be really catching the eye of the coaches, especially Dante Scarnecchia. The rookie has stood out as arguably the best OL in camp thus far. They keep putting more on his plate and he continues to excel. Shaq Mason seems to be healthy now and after watching most of Monday’s practice from the side, got a lot of work inside. Markus Kuhn and Malcom Brown combined for a nice stop early in situational work. They were doubled and filled the hole, allowing Dont’a Hightower to come in and stop Blount for no gain. 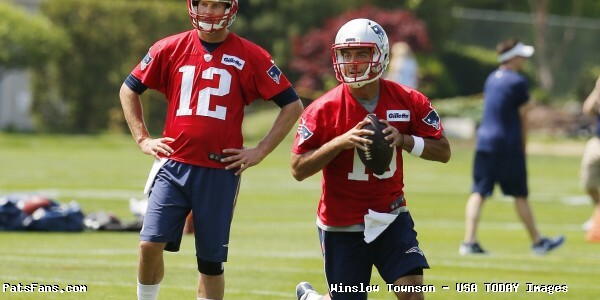 Quarterbacks Start Slowly: Both Tom Brady and Jimmy Garoppolo started slowly in the early 7-on-7 drills. While neither looked particularly sharp, Jacoby Brissett shook off his poor showing on Monday night and followed that up with perhaps his best practice this summer. But Brady and Jimmy G. heated up once the team did their first 11-on-11 drill. Aaron Dobson worked across the middle and easily beat his coverage in the right corner of the end zone for a TD on the pass from Garoppolo. Brady had Chris Harper on a deep route with Malcolm Butler in coverage but the ball was just overthrown, despite a nice diving effort from Harper who just got a fingertip on the ball. Brady lobbed a beautiful arcing pass to Melvin Mitchell who had beaten Cyrus Jones. But just as the ball arrived Jones was able to knock it away. Brady hit Dobson on a deep seam route with Devin McCourty in coverage. Gaffney did a great job of picking up Geneo Grissom on a stunt to give 12 the time to throw. Brissett made a really nice deep back shoulder throw to Mitchell who ran about a 15-17-yard route. He turned with E.J. Biggers in coverage and the ball was right there. Brissett put some nice zip on that pass. Brady recognized single coverage on Gronk with a safety, (Vinnie Sunseri) and threw a jump ball to Gronk in the corner of the end zone that was too easy. Grissom was able to bull rush past LaAdrian Waddle with some nice power. 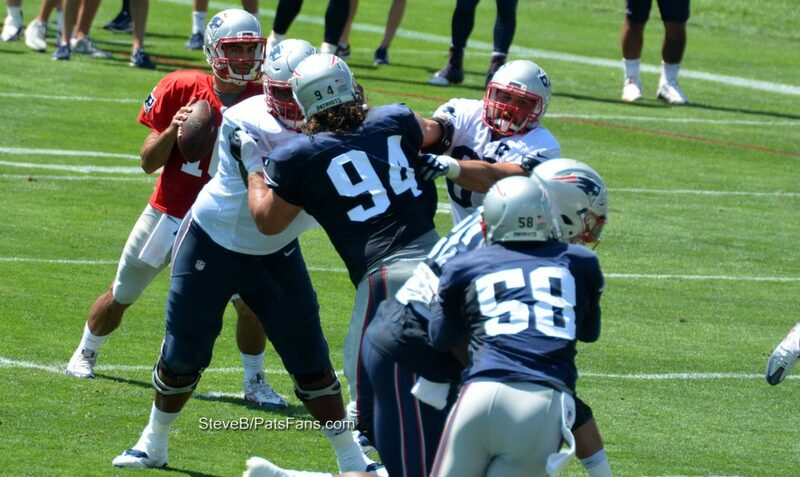 Rob Ninkovich blew past Shaq Mason with a quick move outside. Marcus Cannon pancaked Rufus Johnson who tried to bull rush past him. Jabaal Sheard beat Nate Solder with a speed rush to the outside. Geneo Grissom beat Josh Kline cleanly to the outside. Vince Valentine bulled his way past Kerbyson with some nice power. During the tackling drills where the defender has to shed a blocker and then take down the runner, Markus Kuhn shed a Ted Karras block to take down a runner. And Ninkovich with a quick inside move on what looked to be Cameron Fleming hit the runner for a loss. 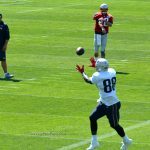 Wide Receivers in Focus: With Amendola and Edelman yet to practice and Chris Hogan and Keshawn Martin out, the younger wide receivers have been getting a ton of reps. We’ve already mentioned some of the work Dobson did, but Chris Harper, DeAndre Carter and Malcolm Mitchell were all displaying some solid work. 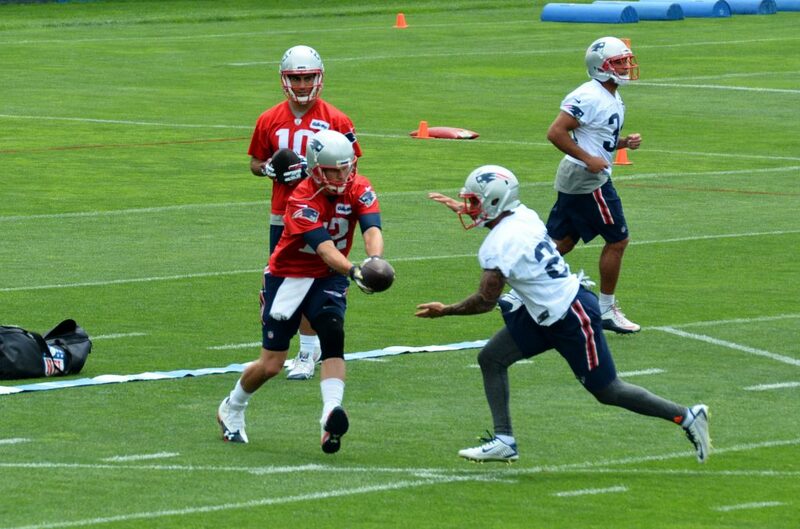 In early 1-on-1 drills, Mitchell spun Justin Coleman completely around and made a nice play on a pass from Brady. He beat Cyrus Jones on one deep play and had another swatted away at the last moment. Carter put a nice move on Cyrus Jones and was in the clear, forcing the rookie corner to grab a handful of jersey, in what was an obvious pass interference. Harper was making plays as well, going all out for deep balls on a couple of occasions. Bill Belichick mentioned the depth at wide receiver earlier. With the top four WRs out, the team was still able to get some good looks on offense. Play of the Day: Late in practice, the team was doing situational work with Bill Belichick calling out the down and distance. With the offense facing a 4th and 1 from the 1-yard line, Brady handed off to Tyler Gaffney. Cornerback Darryl Roberts recognized the play, shot into the gap and was able to fight off the block of Joey Iosefa who has 50 pounds on him and still drop Gaffney for a loss at the four-yard line. With the team having six corners fighting for two slots on the roster, this is the kind of play that the coaches will remember. The Special Teams return game is still led by the rookie Cyrus Jones. The primary job is his to lose at this point. He, V’Angelo Bentley and Matthew Slater were sharing duties but Jones always went first. Joe Judge lit into the coverage team early in the practice for not lining up correctly. He’s a fiery, detail oriented guy and he has an incredible amount of depth to work with this year. I think this special teams unit can be….. special. 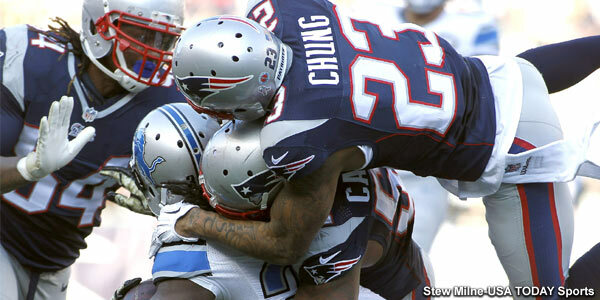 Patrick Chung blocked a field goal attempt late in practice. 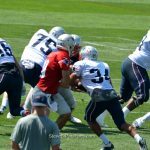 This entry was posted in Patriots Commentary, Patriots News and tagged 2016 Patriots Draft, 2016 Patriots Roster, 53 Man Roster Projection, Bill Belichick, Danny Amendola, Dion Lewis, Dont'a Hightower, Jabaal Sheard, Jimmy Garoppolo, Julian Edelman, LaGarrette Blount, Malcolm Butler, New England Patriots, NFL, Rob Gronkowski, Rob Ninkovich, Tom Brady on August 3, 2016 by Steve Balestrieri. Miss out on today’s action? There were more than 21,000 fans in attendance for Saturday’s practice session. Here are some of the photos from today. 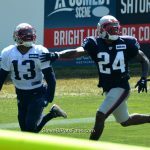 Be sure to stay tuned to PatsFans.com as we’ll post daily after-action reports from the latest at training camp as well as a daily photo gallery. Check back soon for the recap of the practice session from July 30. 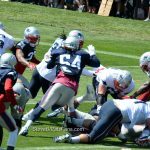 This entry was posted in Patriots News, Patriots Photos and tagged 2016 Patriots Draft, 2016 Patriots Roster, 53 Man Roster Projection, Bill Belichick, Dont'a Hightower, Jabaal Sheard, Jimmy Garoppolo, LaGarrette Blount, Malcolm Butler, New England Patriots, NFL, Patriots, Patriots edge rushers, Patriots Training Camp Photos, Pats, Rob Gronkowski, Tom Brady on July 30, 2016 by Steve Balestrieri. 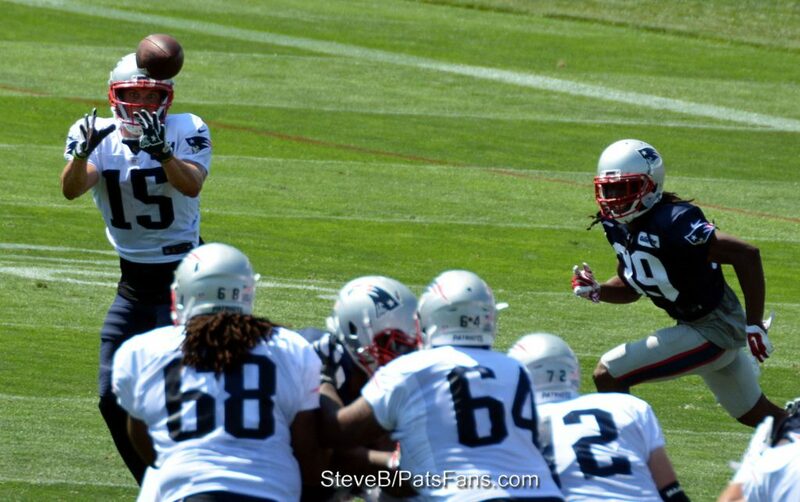 The Patriots first practice session is in the books as training camp is underway. While everyone is trying to break down the exact number of snaps that Tom Brady and Jimmy Garoppolo got with the 1st team offense, that isn’t what I’d take away from the day. The Patriots defense seems like it may be prepping up to be a bit more aggressive this year. With Jimmy G. taking the reins for Weeks 1-4 while Brady gets an early vacation to Costa Rica with Giselle, the pressure is going to be on the defense to step up. That will take a lot of the onus off of Garoppolo and still give the Patriots the chance to win. That’s why some of the lesser talked about developments concerning the defense today may provide an inkling as to how they’ll play. 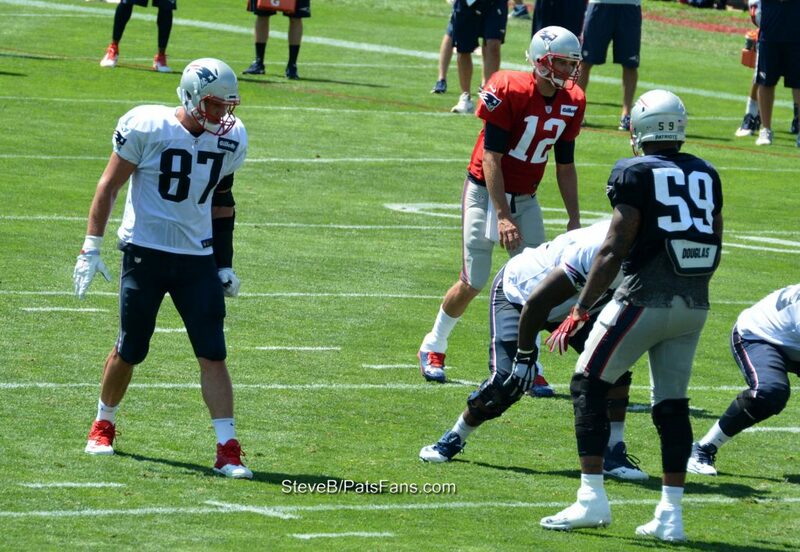 It’s only one day and one practice but the team continues to tinker with Rob Ninkovich and Shea McClellin on the edge. 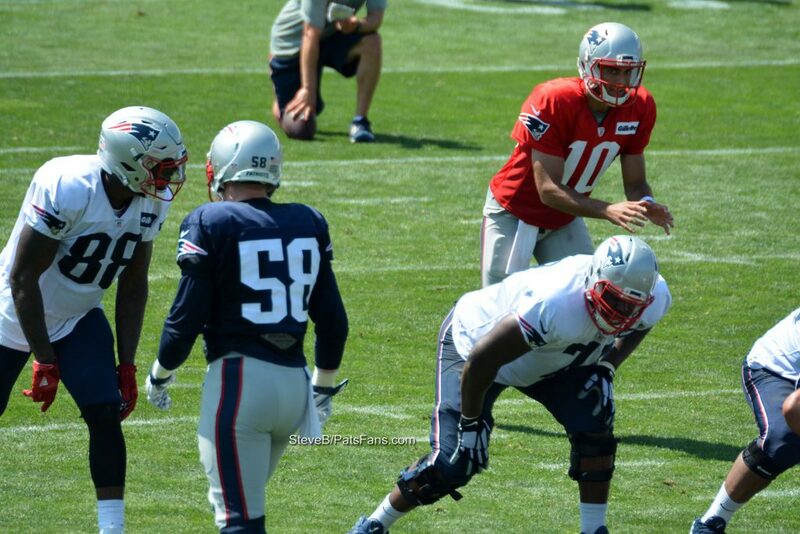 The Patriots worked Ninkovich at linebacker a bit during the spring. That continued during Thursday’s practice session. McClellin who came over from the Bears this offseason spent most of the spring lining up as a defensive end. Today the Patriots had each doing more of the same and more. Both spent some time both rushing off the edge and dropping into coverage. It is significant even though it’s early because it shows, at least initially that the team is going to take advantage of the players’ versatility. By showing different looks, formations and coverages, Bill Belichick and Matt Patricia can be more aggressive and keep opponents off-balance. 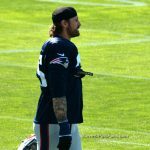 Newcomer Chris Long was mostly quiet on the first day of camp but what was noteworthy for him was that he was kicking inside, similar to what Jabaal Sheard did a bit last year. On obvious passing downs, adding Long as an interior sub-package pass rusher will help keep the pressure on the quarterback. Ninkovich has been a jack-of-all-trades since arriving in Foxboro in 2009. He’s been a long-snapper, an outside linebacker and defensive end. Earlier this summer, Ninkovich hinted around that he’s comfortable doing anything asked of him by Belichick. With an improved and deeper secondary in 2016, the Patriots may be more apt to be a tad more aggressive this season. No team blitzed a defensive back less than the Patriots a year ago. We may now be looking at a little bit of a change. It will definitely be something to monitor as the days go on in training camp. 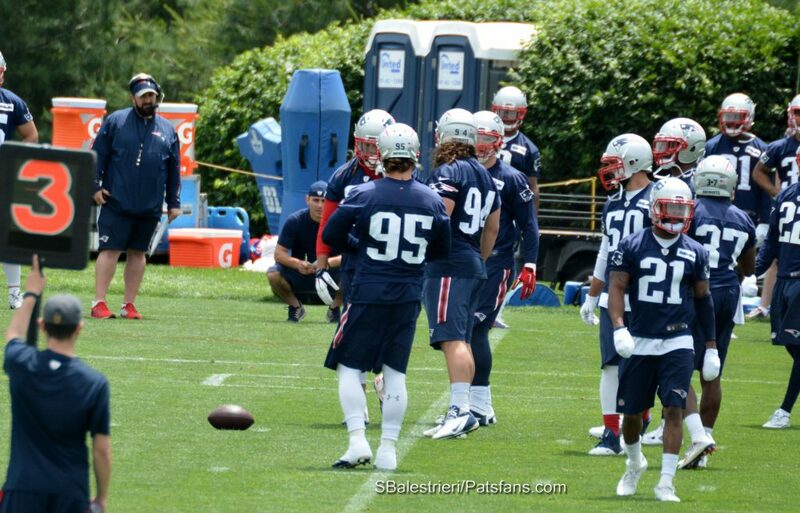 This entry was posted in Patriots Commentary, Patriots News and tagged 2016 Patriots Draft, 2016 Patriots Roster, 2016 Patriots Training Camp, 53 Man Roster Projection, Bill Belichick, Chandler Jones, Chris Long, Jabaal Sheard, New England Patriots, NFL, Patriots, Patriots edge rushers, Rob Ninkovich, Shea McClellin, Tom Brady on July 29, 2016 by Steve Balestrieri.